Synthetic peptide within Human ACADM/MCAD aa 200-300. The exact sequence is proprietary. WB: Human heart or fetal liver tissue lysates; HeLa, HepG2, or K562 cell lysates. IHC-P: Human liver tissue. ICC/IF: HeLa cells. Our Abpromise guarantee covers the use of ab92461 in the following tested applications. IHC-P: 1/100 - 1/250. Perform heat mediated antigen retrieval before commencing with IHC staining protocol. The use of an HRP/AP polymerized secondary antibody is recommended. WB: 1/10000 - 1/50000. Predicted molecular weight: 47 kDa. Defects in ACADM are the cause of acyl-CoA dehydrogenase medium-chain deficiency (ACADMD) [MIM:201450]. It is an autosomal recessive disease which causes fasting hypoglycemia, hepatic dysfunction, and encephalopathy, often resulting in death in infancy. ab92461, at 1/100 dilution, staining ACADM/MCAD in formalin-fixed, paraffin-embedded Human liver tissue by immunohistochemistry. 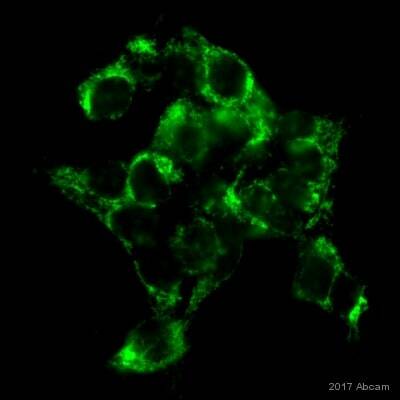 Immunofluorescent staining of ACADM/MCAD in HeLa cells using ab92461 at 1/100 dilution. Flow Cytometry analysis of HeLa (human cervix adenocarcinoma) cells labeling ACADM/MCAD with unpurified ab92461 at 1/50 dilution(10ug/ml) (red). Cells were fixed with 4% paraformaldehyde and permeabilised with 90% methanol. A Goat anti rabbit IgG (Alexa Fluor® 488)(1/2000 dilution) was used as the secondary antibody. Rabbit monoclonal IgG (Black) was used as the isotype control, cells without incubation with primary antibody and secondary antibody (Blue) was used as the unlabeled control. I have isolated mitochondrial, cytosolic and nuclear fraction using standard protocol, also repeated the western blotting with ab92461. I am herewith attaching my result. Band is present through out the sample. Intensity of the band is comparatively higher in cytosolic fraction My question is, if it is specific for ACADM (mitochondrial) why there is a band in cytosolic fraction. All the bands are below 45KDa, ie below expected range. Details of Image from the Left,first 2 bands - cytoplasmic fraction next 3 bands - Nuclear fraction Last 3 bands - Mitochondrial fraction Looking forward for your suggestion. Please help me save my time. Thank you very much for your email. My colleague is in contact with the laboratory in order to try to find out what the problem might is. Indeed we have to investigate this issue further as the quality of our products is most important. We have had no reason so far to suspect any problems with this antibody. Can you confirm also that using no primary antibody - or an alternative rabbit antibody - the secondary antibody alone does not give any signal? Thank you very much for your cooperation. I would like to apologize for the long delays to resolve this issue. In order to allow you to continue with your research meanwhile, I can offer you an alternative antibody against ACADM. I would like to suggest the ab110296, Anti-ACADM antibody [ clone 3B7BH7], a mouse monoclonal antibody tested in WB and on mouse, rat, cow and human. The specificity of this antibody has also been validated with mass spectrometry. https://www.abcam.com/index.html?datasheet=110296 Please let me know whether you would like to accept the alternative antibody. I am looking forward to hear back from you. Thank you for sending the image. We can’t make assumptions for the specificity of an antibody because of its same size band specificity of as of beta actin. Many protein have similar sizes, so experimental evidence is always good to prove the cross reactivity of any ab. I have following recommendations; - Use beta actin negative control lysate e.g. skeletal muscle myocyte and heart muscle myocytes are negative for beta actin so the lysates of these will be a good positive control. ab29330; https://www.abcam.com/Skeletal-Muscle-Human-Tissue-Lysate-adult-normal-tissue-ab29330.html http://www.proteinatlas.org/ENSG00000075624/normal - There is no sequence similarity between ACADM and beta actin so the antibody can’t cross reacts with beta actin. I would suggest using purified beta actin protein as a positive control. http://www.ebi.ac.uk/Tools/services/web_clustalw2/toolresult.ebi?tool=clustalw2&jobId=clustalw2-I20111102-154040-0003-65312871-pg - ACADM is generally present in mitochondrial matrix. Prepare the mitochondrial lysates by getting rid of beta actin to see if the antibody was able to detect the ACADM or not. I hope this information is helpful to you. Please do not hesitate to contact us if you need any more advice or information. PS: Let me know if you are interested in using lysates ab29330; I can offer you 50% discount. Thank you for contacting us. The antibody is specific against ACADM protein only; ab92461 should not recognize the beta actin protein. Could you please explain why you think the antibody is detecting the beta actin protein? In regards to the expected band size of ACADM which is 47 kDa, that may run at different molecular weight due to various post translational modifications however we can’t say the ab92461is detecting beta actin instead of ACADM. I would suggest using beta actin negative lysates as a control lysates for experimental proof e.g. heart muscle myocytes are negative for beta actin. Looking froward to hearing from you. Have a good day! Thank you for your enquiry regarding ab92461 and for taking the time to provide some useful details of the experiments. I am very sorry to hear that you are having problems with this antibody. I appreciate the time you have spent on these experiments in the laboratory and it is disappointing the results have not been successful. To identify the source of the problem I would like to ask few questions; - Was the lysates denatured in loading buffer? We normally recommend our customers using 1X SDS loading buffer with boiling at 100C for 5 minutes. - Could you provide an image? Regarding the band below 42 kDa; is this the only band observed? - Could you specify at what temperature the tissues were treated with RIPA buffer? Also give a breif description e.g. how the lysates were prepared? - Does the band resolved properly in gel? - Finally could you provide the Abcam order number? The order number give in your email does not match any order record for this product. I will look forward to receiving your reply soon.